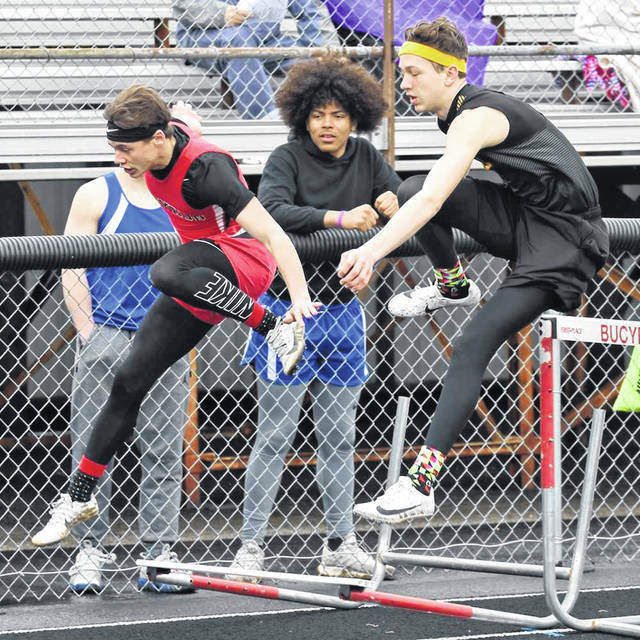 BUCYRUS — On a cold and rainy Saturday, the track and field teams from Galion, Colonel Crawford and Crestline High Schools joined a myriad of others to compete in the annual Bucyrus Elks Invitational. When competition came to a close, the Lexington Lady Minutemen and the Oak Harbor Rockets would be crowned team champions. The Galion squads finished as runner-ups with the Lady Tigers tying with the Crawford Lady Eagles. Colonel Crawford’s boys team finished fourth in the 14-team field while the Crestline boys snagged eight points to finish 12th overall. The Lady ‘Dogs picked up four points and finished 14th on the dismal day of action. Full team placements and scoring on the girls side were: 1. Lexington- 91.5; 2. GALION- 83; 2. COLONEL CRAWFORD- 83; 4. Ontario- 81; 5. Oak Harbor- 80; 6. River Valley- 41; 7. Crestview- 35; 8. Fredericktown- 26; 9tie. Upper Sandusky- 22; 9tie. Harding- 22; 11. Wynford- 21.5; 12. Bucyrus- 17; 13. South Central- 14 and 14. CRESTLINE- 4. The Lady Tigers would win one relay race and three individual events on the day en route to their runner-up finish. 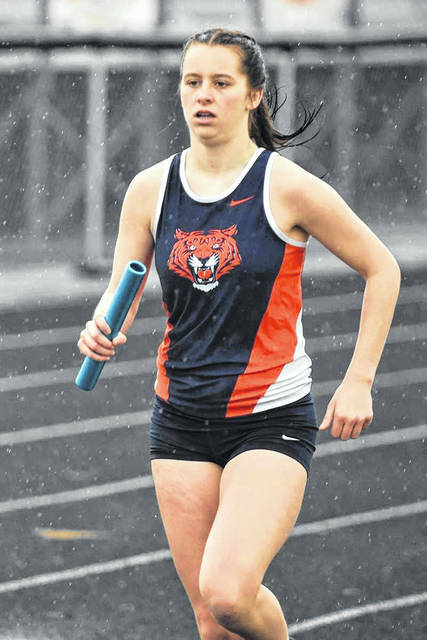 In the 4×100-meter relay event, the Galion squad would outlast the rest of the field and pick up first-place points in a time of 53.23. 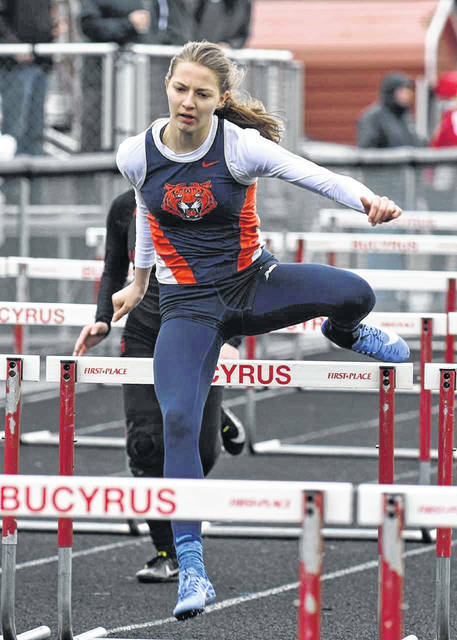 Kerrigan Myers would be a double champion on the day for the blue and orange, claiming the title in the 100-meter hurdles with a time of 16.53 while also out-jumping the field in the high jump, clearing 5-feet, 2-inches to take the crown. The Lady Tigers’ other win came over in the long jump with a bound of 15-feet, 4-inches from senior Jalyn Oswald. For the Lady Eagles, they would net just one championship on the day and that came from Cassidy Vogt in the 300-meter hurdles. Vogt paced the field in the event and took home the top spot with a time of 51.61. Colonel Crawford’s relay teams would earn third in the 4×800, fourth in the 4×200, second in the 4×100 and ninth in the 4×400 on the day. Other placements for the Lady Eagles on Saturday were: 100-hurdles- Katie Ruffener, 2nd and Vogt, 4th; 1600- 11. Alison Manko and Sheba Sulsar- 17th; 400- Drew Krassow, 17th and Courtney Lyons, 21st; 300-hurdles- Ruffener, 3rd; 800- Katie Hanft, 13th and Hannah Willacker, 15th; 3200- Katie Hopkins, 5th and Ally Hocker, 7th; Discus- Lydia Feik, 10th and Corin Feik, 11th; High Jump- Liv Krassow, 2nd and D. Krassow, 3rd; Long Jump- Vogt, 5th and Kiersten O’Rourke, 23rd; Shot Put- Julia Feik, 2nd and L. Feik, 6th. The Crestline Lady Bulldogs saw Rachel Weyant earn all four of their points on the day, picking up a fifth place finish in the shot put. Weyant also finished in ninth overall in the discus. Teammates Riley Wells (29th, disc) and Alandra Tesso (16th, shot) were also in action in the throwing events for the blue and white. Also in action for Crestline Saturday: 4×200, 10th; Caitlin Harley- 16th, 1600 and 12th, 3200; Kennedy Moore- 15th, high jump and 20th, long jump and Ivy Stewart- 14th, long jump. Placements over on the boys side went as follows at the Elks: 1. Oak Harbor- 126; 2. GALION- 86; 3. Bucyrus- 63; 4. Harding- 58; 5. Crestview- 55; 6. Lexington- 44; 7. Ontario- 43; 8. COLONEL CRAWFORD- 42; 9. Fredericktown- 38; 10. Wynford- 34; 11. Upper Sandusky- 14; 12. CRESTLINE- 8; 13. River Valley- 4 and 14. St. Peter’s- 3. Galion’s boys squad may not have picked up a relay victory but they did earn victories in three individual events on the day in Bucyrus. Colbey Fox was the owner of two of those titles, winning the 400-meter dash in a time of 52.16 and the 200 in 23.99. Braxton Tate ran his way to the top spot in the field just after Fox’s final win, picking up 10 points for the Tigers in the 3200 with a championship time of 10:20.29. Tate also finished as the runner-up earlier in the day in the 1600-meter run. Galion’s other placements on Saturday were: 4×800, 12th; 4×200, 2nd; 4×100, 3rd and 4×400, 9th; 100- Evan Barker, 6th; 400- Jacob Williams, 9th; 300-hurdles- Caleb Branstetter, 8th and Carter Valentine, 14th; 200- Kalib Griffin, 6th; Discus- Noah Atkinson, 2nd and Christian Robinette, 10th; High Jump- Jack McElligott, 2nd and Brayden Eckels, 8th; Long Jump- Hanif Donaldson, 5th and Griffin, 10th; Shot Put- Atkinson, 3rd and Robinette, 25th. Braxton James won the only event for the Colonel Crawford boys team on the day, finishing the 800-meter run in a time of 2:07.57 to pace the field and pick up the 10 points. James also earned five points for the Eagles by finishing fourth in the 1600 earlier in the day at the invitational. Other placements for Crawford were: 4×800, 10th; 4×200, 5th; 4×100, 4th and 4×400, 7th; 110-meter hurdles- Alex Mutchler, 3rd; 1600- Alex Lawson, 19th; 400- Gavin Trubee, 20th and Jacob Awbrey, 21st; 300-hurdles- Mutchler, 3rd and Jacob Rahm, 9th; 800- Carson James, 19th; 3200- Ethan McCoy, 9th and Lawson, 10th; Discus- Nick Barnes, 7th and Jonah Studer, 12th; High Jump- Jordan Fenner, 7th and Chase Walker, 9th; Long Jump- Fenner, 1th and Seth Carman, 20th; Shot Put- Studer, 10th and Tajh Smith, 27th. Picking up Crestline’s eight points at the Elks were Logan Parrella and Austin Silverwood. Parrella claimed fourth-place points in the shot put while Silverwood finished sixth overall in the field in the high jump. 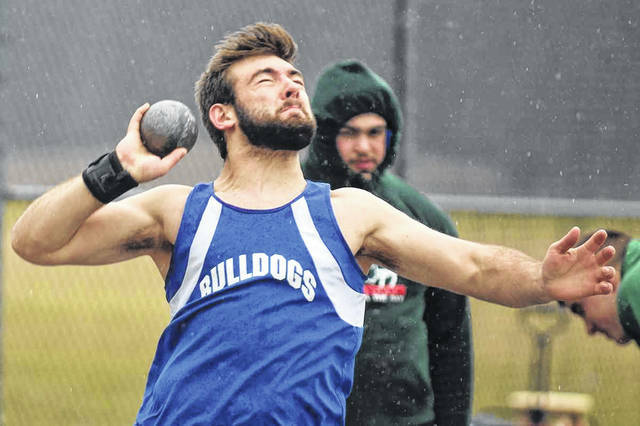 Other placements for the ‘Dogs were: 4×100, 9th; Danny Kiser- 24th, 1600 and 20th, 800; Dakota Wireman- 13th, 400; Parrella- 14th, discus; Jaden Stewart- 18th, discus; Trevor Phillips- 9th, high jump and 17th, long jump; Caleb Moore- 18th, long jump and Ethan Clark- 17th, shot put.